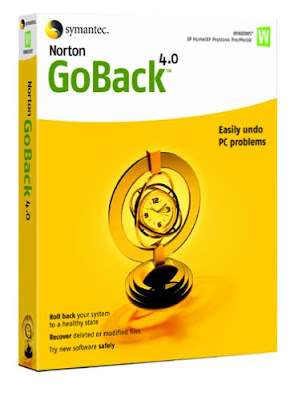 Symantec’s Norton GoBack™ 4.0 allows you to easily undo PC problems. Restore your PC to a healthy state by going back minutes, hours, or even days (depending on available disk space). Also use Norton GoBack to restore files that have been deleted or modified, and to try new software safely. NEW! SafeTry Mode lets you uninstall new software or undo actions with a single click. NEW! Familiar, intuitive search bar makes it easy to find the files or folders you want to restore. ENHANCED! You can now drag and drop recovered files to their desired locations, and rescue multiple files simultaneously. ENHANCED! New user interface lets you quickly recover files, restore an entire disk drive, or activate SafeTry Mode. Restores your disk drive to a previous healthy state after a system crash, failed software installation, user error, virus attack, or other problem. Allows you to restore just the files or folders you need, or an entire drive. AutoBack enables you to schedule regular rollbacks. Very good work dear.Keep working it and give us the best!! !Congratulations.